There are cameras, and then there are cameras. Nikon continues to raise the bar with their latest digital compact camera known as the Nikon Coolpix AW120. Just what makes the Nikon Coolpix AW120 so special from most of the cameras that are out there in the market? 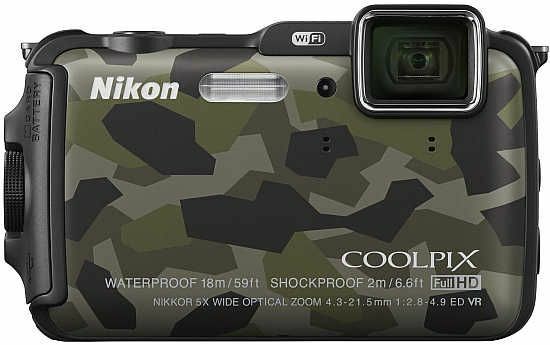 Judging by the external pattern alone on the image above, you get a picture that the Coolpix AW120 is not a fragile device, bearing the rough-and-tumble markings of a soldier’s uniform camouflage. Well, we are pleased to say that the Nikon Coolpix AW120 happens to be waterproof, shock-proof and cold-resistant model, and it does not come up short in terms of capability either, as it boasts of a wide-angle 24mm zoom NIKKOR lens that offers a maximum aperture of f/2.8, making it fast enough for shooting underwater and in dark surroundings. Apart from that, the Nikon Coolpix AW120 will also be accompanied by five-axis vibration reduction which will effectively suppress the effects of camera shake with movie recording. On the outside, the tough material used to encase the sensitive electronics within delivers worry-free use in hard-core outdoor situations, where it is also waterproof to depths of approximately 18 meters. As for its shockproof capabilities, it can withstand falls from up to approximately two meters, and the cold-proofing has been done in such a way that it can withstand temperatures as low as approximately -10°C. Not only that, you will find a range of functions which can support an active outdoor life, including a built-in world map, functions for acquiring location data from GPS and GLONASS satellites, and functions that display altitude, water depth, atmospheric pressure, and water pressure in the camera monitor. the integrated Wi-Fi capability also makes it a snap for the avid shutterbug to transfer photos from one smart device to another without having to deal with pesky wired cables, making life a whole lot more convenient. Could the Coolpix AW120 usher in the golden era of the Olympus Mju all over again?